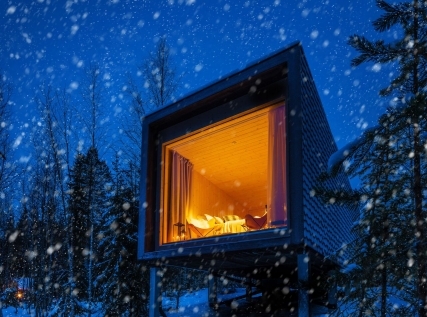 Opened in December 2016, the new Arctic TreeHouse hotel aims to elevate an overnight stay in Finnish Lapland to new heights. 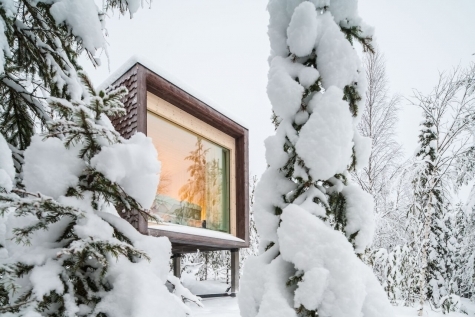 Nestled amongst the heavily snow-laden trees of the Arctic forest are a series of thoughtfully constructed cabins, whose panoramic windows frame an incredible winter landscape. 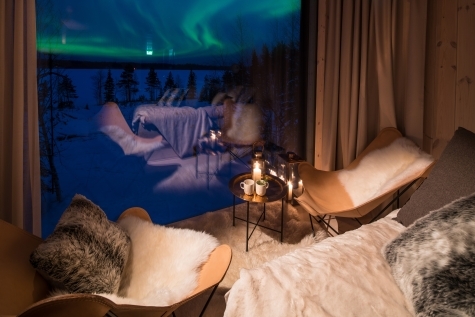 Spend the daytime ticketing off a bucket list of activities and evenings snuggled in a cosy cabin, gazing at the Arctic sky, where if the conditions are right – a display of the Northern Lights can be dancing overhead. Fly to Rovaniemi, the capital of Finnish Lapland from London Heathrow, Gatwick or Manchester and transfer to the Arctic TreeHouse Hotel. It may only be ten minutes to the resort, but on arrival, you will feel a million miles away. Check into your cabin amongst the trees and familiarise yourself with your surroundings. Dinner is served in the adjoining Arctic TreeHouse Hotel restaurant, where you can enjoy delicious dishes and traditional Lappish cuisine as well as a panoramic Arctic view, before retiring to your own cabin. Rovaniemi is the capital of Finnish Lapland and has long been a popular choice for those wishing to visit the ‘home’ of Santa Claus. However, Rovaniemi is not just for Christmas and the surrounding Arctic wilderness provides a perfect setting for a wealth of activities to suit every kind of visitor. Take a thrilling snowmobile or husky safari, a romantic reindeer sleigh ride or head out for a day trip on an ice-breaker and swim in the frozen sea. Go in search of the Northern Lights or try the traditional Finnish past-times of cross-country skiing and snow shoeing. Wilderness dinners and ice lunches are also on the menu and don’t forget a hunt for the Northern Lights. With everyone having their individual bucket list to tick and numerous activities to choose from, we have left these two days free for you to pick your own adventure. Please see our favourite excursions listed on the excursion tab. Alternatively speak to one our travel experts who can discuss the choices with you. We do recommend pre-booking any activity to avoid disappointment. Breakfast and dinner at the Arctic TreeHouse is included throughout your stay. We can change this arrangement if you so wish. It has been a short stay, but no doubt filled with many lifelong memories to take home with you. After check-out, we have arranged a transfer to get you to the airport in time for your return flight home. 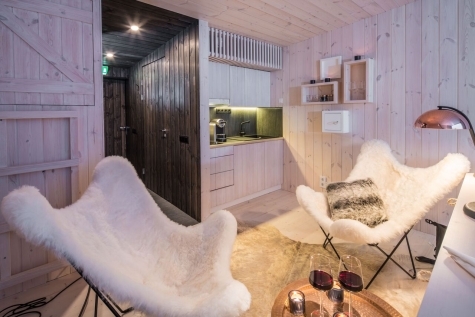 The Arctic Treehouse is more than just a novelty overnight stay whilst in Lapland. 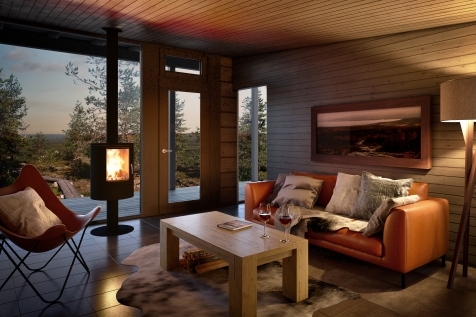 The cabins have been meticulously furnished and the warm timber interiors are complemented with an array of throws, cushions and chairs that typify the classic modern Scandinavia style. The cabins are perfectly designed to accommodate couples seeking a romantic escape or families whose children will love their very own ‘nest’. Each cabin has its own private WC and shower, flat screen TV, free Wi-Fi, expresso coffee machines, twin or double beds and of course a floor to ceiling panoramic window, which gives the feeling of the nature being indoors. Families can book interconnecting suites complete with cosy nest beds and kitchenettes. The restaurant is just a short walk from your cabin and it is here that breakfast and dinner is served and for those seeking a Santa experience Santa Park is just across the road and open from mid-November to the first week of January. During the winter months the Gulf of Bothnia freezes over turning what in the summer months is a sailor’s paradise, into an endless frozen wilderness, almost impossible to pass. Take a trip on board one of the icebreakers as it carves its way through this incredible landscape. This full day excursion starts with a 2-hour bus transfer into Sweden before boarding one of the impressive Arctic Icebreakers. As the Captain maneuvers his ship out of the harbour, you will experience first-hand splitting of the ice, which in some places can be up to 2m thick. At a suitable point in the journey, you will have the opportunity to disembark and don a survival suit and swim in the frozen sea and receive a certificate honouring your bravery. Transfers and lunch included. Suitable for all ages (children are pulled on a sled behind the guide) and those who have never snowmobiled before, this short snowmobile safari gives you the opportunity to drive a snowmobile around the Arctic Circle. Enjoy beautiful snowy landscapes. Stops are taken along the way so that you can swop driving duties and take photos. Hotel pick-up, transfers and outer thermal clothing included. This tour is specifically aimed at families with small children and offers both adults and children the opportunity to drive a snowmobile. First head out and explore the snowy trails surrounding Rovaniemi. The adults will drive in pairs, whilst the children travel in a sleigh pulled by the guide. On returning to the camp it is then the children’s turn to drive their own mini-snowmobile. A bonfire is lit as you take it in turns to grill sausages and sip hot drinks to keep out the chill. Hotel pick-up, transfers and outer thermal clothing included. Experience and explore the vast taiga forests of Lapland as you mush a team of dogs through the remote trails just north of Rovaniemi and the Arctic Circle. The length of the trail does depend on weather conditions, but a distance of 30-40 km is often covered. A stop is made for a wilderness lunch, served around a campfire, before heading back to civilization, master of your four-legged friends. This excursion is best suited for adults and you can choose to share the driving or take control of your own sled. Hotel pick-up, transfers and outer thermal clothing included. A chorus of howling hounds will greet you, all eager for their morning or afternoon run. After receiving a full safety and skills briefing, head out into the Arctic wilderness. Children can travel in the same sledge as their parents, who can take it in turns to mush. The length of the trail can vary according to the weather conditions and mushing skills of the participants, but it averages 16-22 km and takes about 1 hour 30 minutes. On returning to the farm you will be rewarded with hot juice and cookies and hear how these marvelous animals are cared for. Hotel pick-up, transfers and outer thermal clothing included.